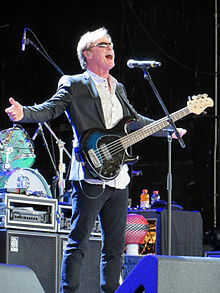 Richard Page (born May 16, 1953) is an American musician who is best known as the lead singer and bassist of 1980s band Mr. Mister. The band's hits include the classic hit single Broken Wings and Kyrie. Since the early 1980s, he has also been renowned background singer for many artists and bands, and a solo artist since 1996. He also wrote songs for popular artists such as Barbara Streisand, Celine Dion, Dionne Warwick, and Josh Groban, among others. Page was born on May 16, 1953 in Keokuk, Iowa. His parents, Robert and Joyce Page, were both professional musicians. Robert was a singer and choral director while his wife was an accomplished organist, pianist, and singer. In the mid-1950s, the family of seven (Page has a sister and three brothers, who are all musicians) moved to Montgomery, Alabama, where his parents worked as music directors at a local Methodist church. His mother knew Richard had a special interest in the family "business" when he came home from Sunday school to announce that he was the only baritone in the four-year-old class. The Pages lived in Montgomery from 1955 to 1962. In the late 1960s, the family moved to Phoenix, Arizona where his mother worked as the Assistant Director of the Phoenix Boys Choir for many years while his father was a musical director at a Phoenix church. Page attended Central High School, performing in school musicals such as Oliver!. "It was a great experience, I was a horrible student, I had to beg the vice-principal to graduate me,” Page said in 2015. “He did because he knew my interests were in music, I had sort of excelled in that area.” He cited that his musical influences at this stage included The Beatles and The Beach Boys. On the day he graduated in 1971, Page moved to Hollywood. In Los Angeles, Page and Steve George, a friend from Phoenix, “knocked around the LA music scene, eventually working with topflight acts like REO Speedwagon, Andy Gibb, Al Jarreau, and Kenny Loggins.” Page turned down the offer to be the lead singer for the bands Chicago and Toto. The position that he turned down with Chicago was accepted by Jason Scheff. His first major band, Pages, was formed with his childhood friend, Steve George, after he moved to Los Angeles from San Diego in the late 1970s. After producing three "Pages" albums, Page and George formed Mr. Mister along with Steve Farris and Pat Mastelotto. Page was on vocals/bass, George handled keyboards, Farris played guitar, and Mastelotto was on drums. The band’s first album was I Wear The Face (1984). Page has said that in this album the band was "just getting together and figuring out" how they wanted to sound. As frontman for Mr. Mister, Page scored two consecutive Hot 100 No. 1's with the singles "Broken Wings" and "Kyrie", both of which Page composed in collaboration with another Phoenix friend, John Lang. Both songs were released in 1985 and appeared on Mr. Mister's breakthrough second album, Welcome to the Real World, which also came out in 1985 and reached No. 1 on the albums charts. The group was nominated for several Grammy Awards, including Best Pop Band in 1986. Many of Page's songs for Mr. Mister, and many of his solo numbers, were co-written with Steve George and John Lang.."
Subsequently, he was a member of Third Matinee with Patrick Leonard, before he released his first solo album Shelter Me in 1996. It featured the singles "The Best Thing" and "My Oxygen", a remake of Nik Kershaw's hit. In 1997, he turned down an offer from Leonard to record a second Third Matinee album. Following Shelter me, Page worked as a songwriter and session player. His songwriting clients include Kenny Loggins, Madonna (Golden Globes and Grammy nominated song, "I'll Remember" from With Honors), Josh Groban, Céline Dion, Chaka Khan, Donna Summer, Dionne Warwick, The Pointer Sisters, Meat Loaf, Patti LaBelle, Hall & Oates, BB Mak, Bill Champlin, Al Jarreau, Leona Lewis and many others. He was the lead vocalist on a tune written by Donald Fagen called "Green Flower Street", which appeared on the 2000 album entitled "Birdland" by Masanori Sasaji and the L.A. Allstars. Page performed his own material in December 2008 for the first time since Shelter Me. The song entitled "I Always Cry at Christmas" was co-written with Walter Afanasieff. In 2010 Page released two of his own song collections, Peculiar Life, which he recorded, noting that writing for others was not as satisfying as writing a song for himself, especially when it entailed compromises. In the same year, he also released the album 5 Songs for Christmas. These were followed by Solo Acoustic (2011) and Songs from the Sketchbook (2012). Based on a recommendation by his friend, songwriter Richard Marx, Ringo Starr approached Page to join his 11th All-Starr Band and, in the summer of 2010, they embarked on a 32-date U.S. tour and, then in 2011, they embarked on a 40-date Europe tour. Page also toured with Ringo's 12th All-Starr Band in the summer of 2012, 2013, and 2017. On its first tour, Ringo Starr’s All-Starr Band also included keyboardists Edgar Winter and Gary Wright, guitarists Rick Derringer and Wally Palmer, and drummer Gregg Bissonette. Richard lives with his wife Linda and their four children in Malibu in southern California. Page performed backing vocals on Peter Allen's 1980 album Bi-Coastal as well as on Barbra Streisand's 1985 recording of "I Know Him So Well" for The Broadway Album. He also performed a duet with Cher, "One Small Step", as well as backing vocals on her 1991 album Love Hurts. 1983: Bent Out of Shape - Rainbow (backing vocals) "Street of Dreams"
1984: Straight Ahead – Amy Grant (background vocals); on "It's Not a Song"
1986: David Foster – David Foster; on "Who's Gonna Love You Tonight"
2005: The Day After Yesterday; duet with Rick Springfield on his cover of "Broken Wings"
^ a b Kozinn, Allan (January 12, 2010). "Ringo Starr Plans to Be Touring When He Hits (Drumroll Please) 70". The New York Times. ^ Songfacts. "Kyrie by Mr. Mister - Songfacts". www.songfacts.com. Retrieved April 5, 2019. ^ a b c Hunt, Dennis (December 1, 1985). "Mr. Mister's Mr. Party turns Mr. Clean". Los Angeles Times. Retrieved March 11, 2012. ^ a b Wardlaw, Matt (August 11, 2010). "The Popdose Interview: Richard Page". Popdose. Retrieved April 5, 2019. ^ a b c FOX. "Richard Page of Mr. Mister is from the valley". KSAZ. Retrieved April 5, 2019. ^ "'Incredibly Unlikely' Mr. Mister Will Ever Reunite, According to Former Drummer – BlastEcho". Retrieved April 8, 2019. ^ a b c "Richard Page Interview July 2014". www.museonmuse.jp. Retrieved April 8, 2019. ^ Thomas, Bryan (September 25, 2018). ""When We Hear The Voices Sing": Mr. Mister were one of the mainstream "Best Bets of '86"". Night Flight. Retrieved April 12, 2019. ^ "Biography: John Lang". users.skynet.be. Retrieved April 12, 2019. ^ "Paging Mr. Party". Los Angeles Times. December 15, 1985. This page was last edited on 15 April 2019, at 03:45 (UTC).